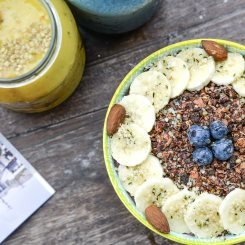 Bare Naked Bowls is one of Australia’s favourite superfood cafes specializing in serving delicious Acai Bowls, Superfood Smoothies, Breakfast Bowls, Cold Pressed Juices, Locally Roasted Coffee, Kombucha and Raw Treats. We cater for all needs including vegetarian, paleo, vegan, dairy free and gluten free – just ask our friendly staff. Our Sydney stores are located in Market Lane, Manly; Macpherson Street, Bronte; Crown Street, Surry Hills and 9 The Strand, Dee Why, Bare Naked Bowls specialise in delivering the best acai bowls. Our Brisbane store is located at 55 Sherwood Road, Toowong and our Newstead store opening early April 2019. We use only the freshest, mostly organic, ingredients including seasonal fresh fruit, together with the latest superfoods including acai, pitaya, cacao, matcha, hemp seeds, chia, activated buckini and loads of other exciting ingredients. At Bare Naked Bowls we believe in living a conscious and active lifestyle and is why we deliver food that will give you a healthy boost of energy. Our bowls will leave you feeling refreshed, energised and ready to take on the day. Bare Naked Bowls is proud to support IBSH, a charity that helps disadvantaged and orphan children in developing nations to achieve tertiary education and better life opportunities. It is our mission to make healthy living effortless and simple. Bare Naked Bowls is based on the concept that healthy living shouldn’t mean depriving yourself. Our principles are always to use fresh delicious ingredients bursting with wholesome nutrients to create plant based foods. By dining with us today you are also contributing to our non-for-profit charity The International Brothers & Sisters House. A charity dear to our hearts as we help orphan children through higher education in Nepal and Tanzania. We are well known for our creative and tasty bowls – do yourself a favour, come in and grab one now. At Bare Naked Bowls we believe in nourishing your body with real food; no highly processed foods, no chemicals, no high-fructose corn syrup – just real food combined in creative and delicious ways. We are proud to serve local and mostly organic ingredients which gives you the energy you need to make the most out of your day. Most of our food at BNB is sourced locally. We pride ourselves on a close relationship with our suppliers and are well aware of the benefits of buying ingredients locally and do so at every opportunity. It’s all about eating real food. We pride ourselves on delivering truly beneficial food to your body. Our dishes are loaded with fresh fruits, nuts, seeds, superfoods and grains. Our almond milk is made in-house every morning along with our raw treats that will fuel your body with energy for the whole day. Bare Naked Bowls was born out of a passion to travel, help others, and the strong desire to maintain a healthy lifestyle. We work hard to maintain a culture that is an authentic representation of our values and our vision for the world in which we want to live. 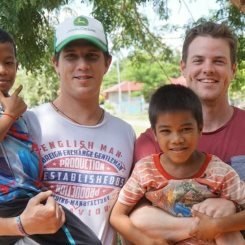 Which is why we are proudly partnered with The International Brothers and Sisters house, a charity that supports orphaned children in developing nations including Nepal, Tanzania, and Cambodia. We strongly believe that education is the key to one day ending world poverty and to that end, 1% of every purchase made in our stores will go directly to IBSH and help these children in need. Bare Naked Bowls is the creation of Josh and Ashley Porteous. They met volunteering in Arusha, Tanzania in July of 2013. Josh from Sydney, Australia had given up a corporate life to volunteer in some of the poorest countries on this earth for one year and Ashley from Santa Barbara, California had worked hard over her summer break from college to volunteer in Tanzania for one month. As fate would have it, they were sent to the same volunteer house and the rest is history – 2014 was a big year for them – they started a charity together, were married and fell pregnant. However, these times were not without there challenges and in mid 2014 both Josh and Ashley battled some nasty parasites whilst volunteering in Nepal. It was during this time that they realised that living in developing nations was not something they could do full time, they needed time back in the first world to focus on their health. After ridding themselves of the parasites, they went about changing their diet and lifestyle. They spent one month in Santa Barbara, California where they were introduced to the Acai Bowl. They had it for breakfast or lunch, before between or after exercising, there was absolutely nothing better than an acai bowl. It truly is an incredible meal – it fills you up, does not weigh you down, and gives you the energy and nutrition you need to flourish. At the same time they were becoming increasingly interested in super foods & organic foods and the benefits they have when introduced into an active lifestyle. This opened their eyes to where our food actually comes from, how it is produced, and the positive effect it has on our health. They talked constantly about how to balance their lives. 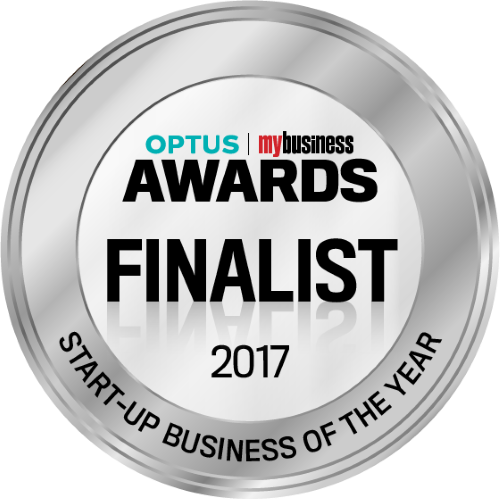 Their charity and their growing family was the priority but so was the need for a sustainable business to support what they choose to do. Combine this with their new healthy outlook and everything fell into place. They were going to bring the Acai Bowl to Manly and do it their way. Bare Naked Bowls was born. They combined their passions – healthier lifestyle, their family, better food, building their charity, active lifestyles, and acai bowls. 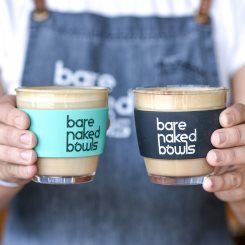 Bare Naked Bowls stores are located in Sydney at Manly, Bronte, Surry Hills, Dee Why and In Brisbane at Toowong.